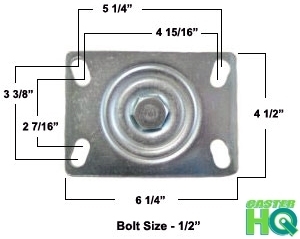 CasterHQ's Cast iron V-groove wheels come included with a straight Roller Bearing and Spanner Bushing and are made specifically for use on inverted angle iron tracks or steel tracks for industrial, manufacturing, and material handling applications; they can also be used on flat surfaces, residential, and commercial sliding gates. Our V Groove wheels have a machined bottom groove for better load equalization compared to other brands. Grooved wheels are also commonly used in powder coating applications. 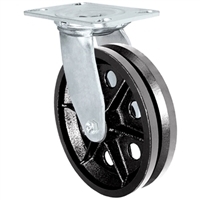 Our standard components included in our Grooved Casters include all metal parts for higher temperature applications over 180 Degrees Fahrenheit. 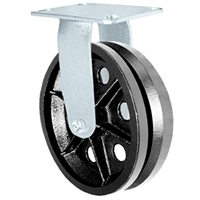 These V-Grooved Wheels are precision machined 90 Degrees with a 7/8" Relief groove for standard inverted angle tracks or steel tracks. Zerk / Grease fittings are included on the Swivel Raceway, Hub of the wheel, and the axle giving you 3 points of lubrication for easy maintenance. 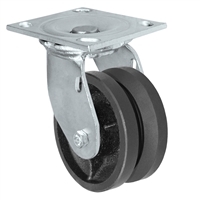 We offer 4" diameter all the way to 10" diameter Swivel and Rigid Casters and also sell a 12" wheel only if you are in need of that size. 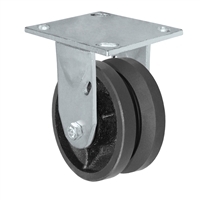 Our standard groove casters are competitively priced and fully stocked so we can ship out the same or next business day on all order sizes.